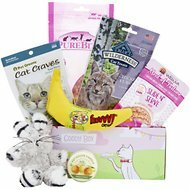 Cat Charmer is an interactive cat toy designed to charm and not harm. 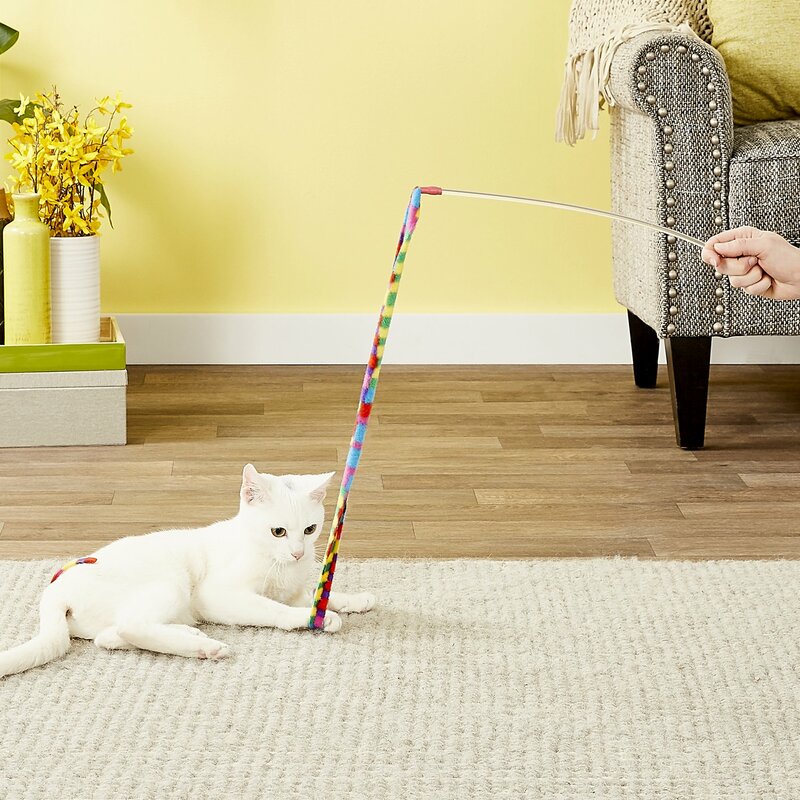 With an unbreakable, polycarbonate wand and four feet of very colorful fabric, Cat Charmer provides excellent aerobic exercise and is a safe interactive toy for all kittens, cats, and kids. 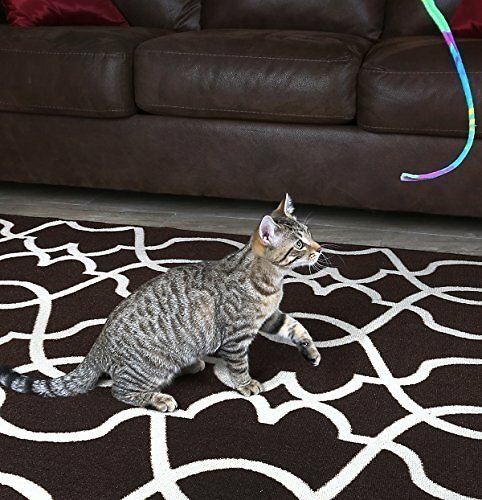 Provides excellent aerobic exercise and is a safe interactive toy for all kittens, cats, and kids. 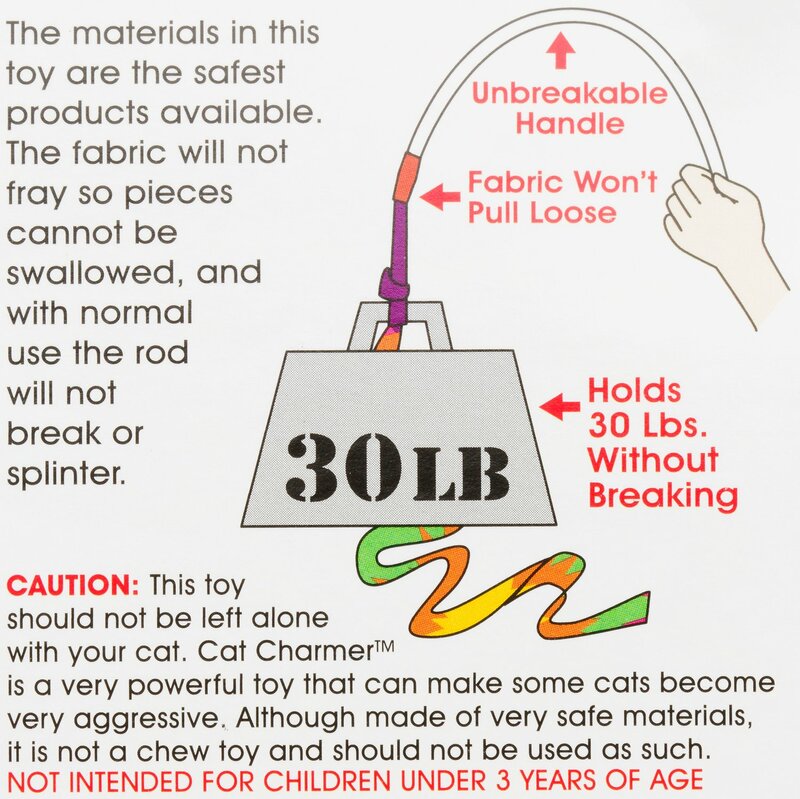 HAZARDS TO HUMANS: Not intended for children under 3 years of age.rnHAZARDS TO ANIMALS: This toy should not be left alone with your cat. Cat Charmer is a very powerful toy that can make some cats become very aggressive. Although made of very soft materials, it is not a chewy toy and should not be used as such. Max, the wild child and Dixie the observer give this toy a 10 plus . It's extra long and can be snapped to sound like a whip. I can sense the excitement ramping up and it spreads to us all.It can get knots in it when playing hard and shortens the whip but they;re easy to get out if caught early.This is a toy which makes 3yr. old Max think he's still a kitten. Every cat should have this toy! My two cats absolutely LOVE this toy. They have played with other wand type toys, but this one is their favorite by far. As soon as they see it come out, they are 100% engaged, and will play with it as long as I am willing to make it move. They are much more engaged with this toy compared to others. They chase, jump, and pounce on it with their 'wild' cat eyes watching it's every move. I bought the rainbow option, and highly recommend it. Cats love Cat Dancer toy! I have a kitten who is now 10 months old and loves all toys on a wand with string. She has a few toys different made hanging from string & just loves to play! She sits on back of couch looking at top of bookcase seeing her toys & talks to me when she wants to play. She will go on and on until I get it down and play with her. She is so cute and full of energy! Love watching her play and enjoying herself with these type of toys. My other cats love to get on the action when they can it from her. ALL PAWS UP from my cats. The rescue cat - previously lived outdoors - is finally learning how to "cat" and loves this toy - he even plays with it, at times, himself. But it's super fun and it gets him engaged - I really enjoy watching him play with this and it can be used in so many ways for play time. We have purchased cat charmer toys for years. Our cats absolutely love them. However, this one has an EXTREMELY short strap. Much shorter than ones we have purchased in the past. The cats don't seem to be interested in this one. The short strap makes it difficult to chase and maneuver. It's at least 12" shorter than our other cat charmers. It was a hit right out of the box. 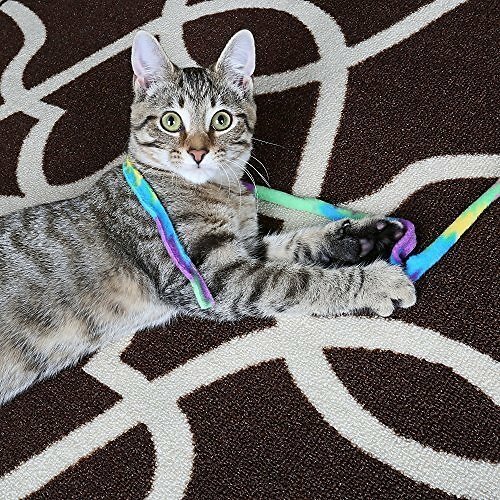 My cat gets alert the second we touch the wand, and will play hard. It's fun for the humans too....I can crack it like a whip and it doesn't hurt when it hits (I tried it on myself first), and it's fun to hear the snap. It's irrisistable. 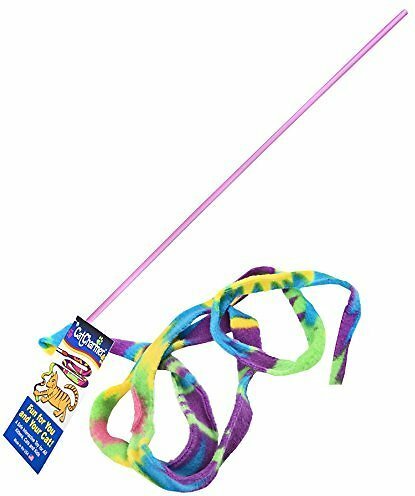 If you have a cat, they will play with this, even if they've never played a day in their life. 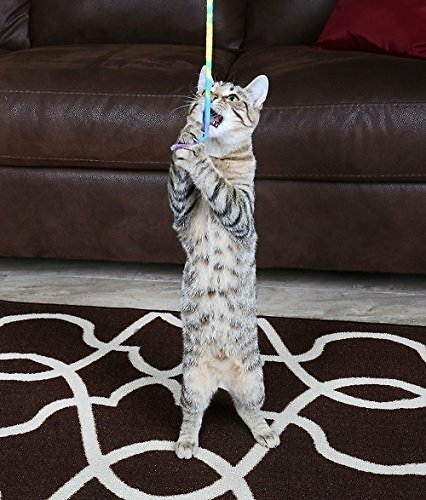 It's a long string of a fleece type fabric on a stick, and all 3 of my cats go crazy for it. Whoever made this cat toy is a genius and made two simple items into a cat toy that no cat will be able to resist. My babies love this but they really liked the little unicorn one I bought on chewy. This is there Plan B teaser wand. I recommend it, it’s definitely interactive and there isn’t any parts that would come off as a hazard or anything. No bells no noise, it’s a quiet toy, and definitely long enough to twirl around!